I know that this is off topic, but this is for GDElla. 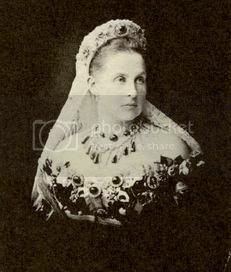 I believe that it is the only known likeness (from the late 1860's by the look of it) of Margherita wearing the full parure of emeralds and really is not as clear as one would like. however it shows, diadem, earrings, necklace, brooch and possibly bracelet(s). I will try to dig out the info about this suite later if I have time. GDElla, do you know anything about the lovely ruby necklace that both Anne-Marie and Frederika are wearing? 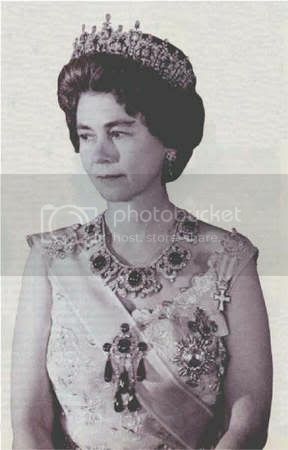 Do you think that it could have been made fromthe central elements of Olga's choker (that she is wearing with the ruby tiara)? I don't know if it was made from Olga's choker or whether an entirely new necklace was fashioned out of remaining rubies--would we all have such problems. You are so sweet! I had only been able to thumb through the book while on vacation. I'm hoping to maybe get it for my birthday but at a good price--I hadn't gotten it because I liked Munn's book better and they're both pricey. I like that it goes into jewels beyond tiaras though. Thanks so much! GDElla, really it is the least that I can do after all the help and encouragement that you have given me since I joined! Did you get the Munn book? It really is the kind of book that will be worth money some day soon. It is so beautiful and well written; Geoffrey has a lovely writing style which isn't overly academic or dry. I bought the Bernard Morel book 'The French Crown Jewels' about ten years ago and paid about $200 for it then; it is a great and scholarly work but a bit too scholarly....Geoffrey's book at less than half that price is good value for money. The Meylan book is good, not very in depth though factually, so if you have to choose, get the Munn book. I wrote about meeting Geoffrey in the Wartski thread in the Antiques section, if you are interested in the tale of how a middle aged man (me) thought that all his Christmases had come at once! In the meantime, keep the jewels coming...I can't get enough! CP Mary is one gorgeous woman! I love that color on her. Her prince is a lucky man. But I'm surprised to see her wearing a tiara before her wedding; etiquette says that an unmarried woman doesn't wear a tiara to a ball. She first wears one on her wedding day. 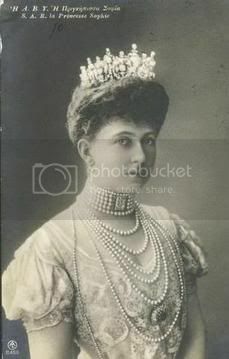 Some women wear the tiara into the church on their wedding day; others follow the tradition that the tiara isn't donned until after the ceremony is over. Sarah, Dss. of York, though not an examplar of proper behavior in most ways, followed this tradition and wore flowers in her hair when she entered the Abbey. 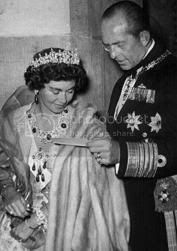 She removed them while signing the register and emerged from the Abbey in a ruby and diamond tiara. 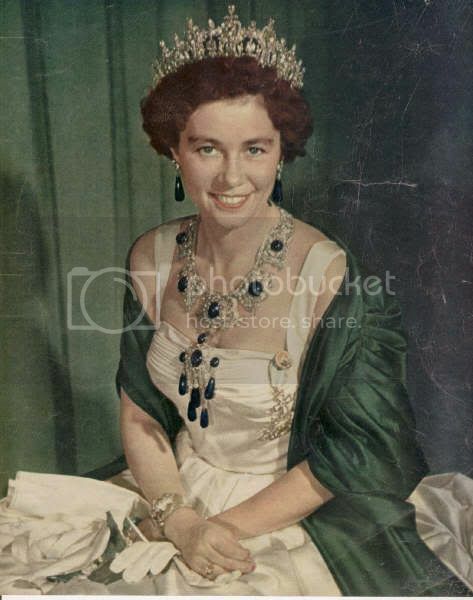 Some info on Queen Margherita's emerald parure : it was ordered to the Viennese jeweller Delsotto by King Carlo Alberto of Sardinia as a wedding present for his daughter-in-law the Archduchess Maria Adelaide. 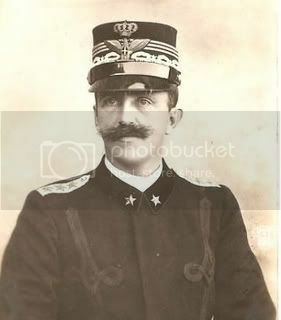 When Margherita married Adelaide's son Umberto, she inherited the parure. 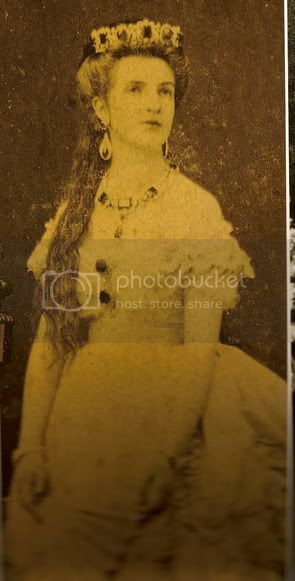 In this page Amedeo, another Italian user, sent other photoes which represent Queen Margherita. She looks here so lovely! Does anyone know who is in current possession of Freddie's emerald collection as shown in the portrait above? 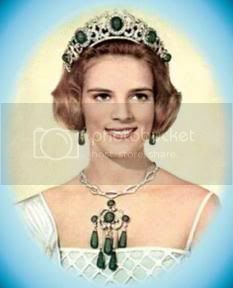 Queen Anne-Marie was given the emeralds upon her marriage to King Constantine. However, Q. 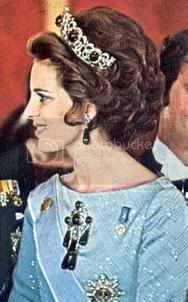 A.M. wears the emerald necklace as a tiara, as compared to Queen Frederika who wore it as a necklace. Q. 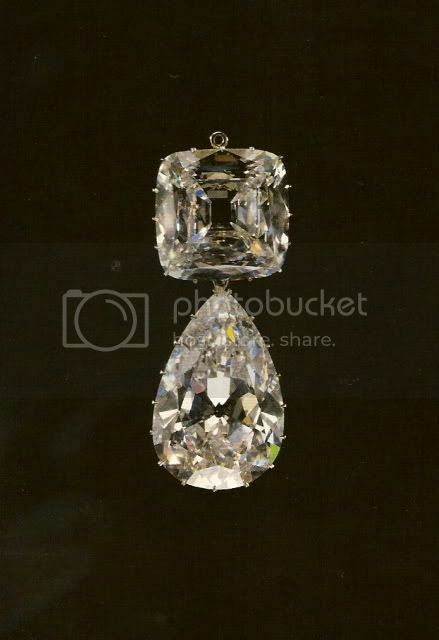 A.M. wears a necklace her mother gave her upon her marriage instead, and uses this necklace to hang the emerald droops. 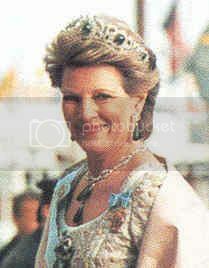 Here is a link showing how Queen Anne-Marie wears them. 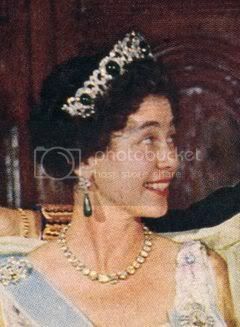 She seems to have liked to wear Sophie's tiara with the emerald set.